Strawberry Chic: A couple of updates . . .
A couple of updates . . .
As most of you know, I started trying out the "CG" curl method a few weeks ago. I think it has been going pretty well...my hair is definitely curling better and a little less frizzy. Although I have to admit, it's still not curling quite has well as I would like it to. On the plus side, (or weird side,) I have not used ANY shampoo in like 4 weeks and my hair really isn't greasy. Looking at these photo makes me realize that I need a trim, and I need to re-color my hair (if you have never colored your hair before, don't do it! It has been an ongoing battle for me since I first did it my sophomore year in high school...I keep trying to just grow out my natural color but I can't stand when the dyed section starts looking all weird and orange-y)! As for my other update (if I am having a boy or girl)...Well, it will actually have to wait until tomorrow because I don't go in for my appointment until 1:00pm today. You could always try a very short bob with just your natural hair color to start over. I think one could be really cute; Just thinkin' out loud. I don't wash my hair with sulfate/sudsy shampoo anymore either. My guess is a boy!! Sulphates are so harsh on curls, love that the method is working for you. Your hair looks great! 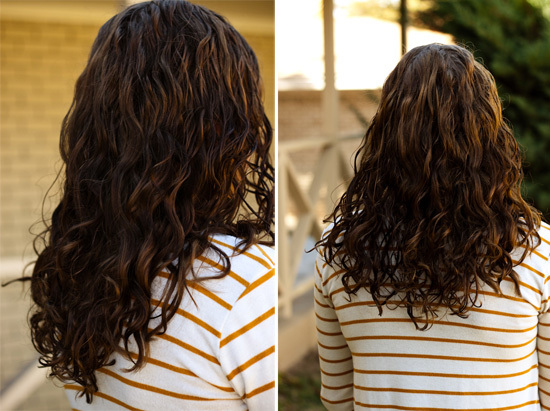 I agree, your hair looks great - I have super curly hair that I can never ever figure out how to style so I am going to check out that curl method!